We’re on Day Three of our BABY SUITE I BLOG TOUR! 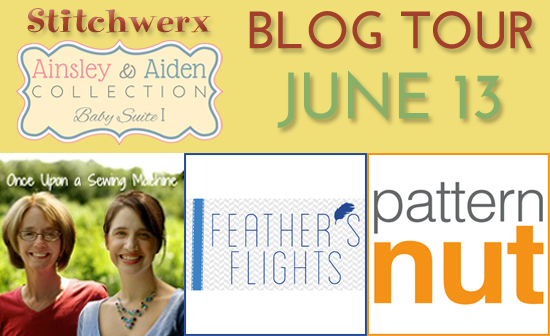 Today’s fabulous group of blogger/reviewers includes Once Upon a Sewing Machine, Feather’s Flights, and Pattern Nut. I am very excited to see what each of these reviewers has to share about the Ainsley and Aiden Collection, Baby Suite I patterns. Please stop by each of their blogs to see their creations, and read what they have to say about this set of patterns. See the full BLOG TOUR SCHEDULE at the end of this post. 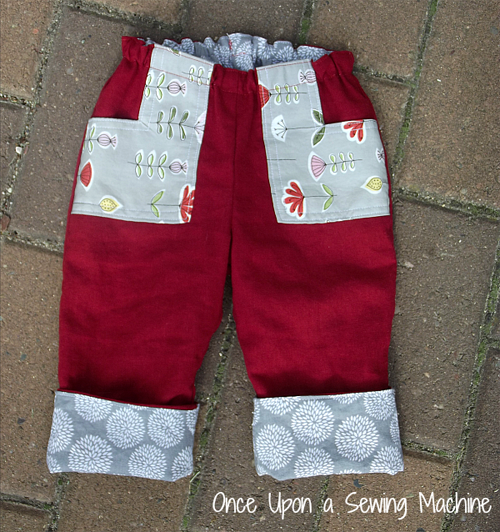 Rachel’s (Once Upon a Sewing Machine) fabric combination in the Roly Poly’s are fabulous! 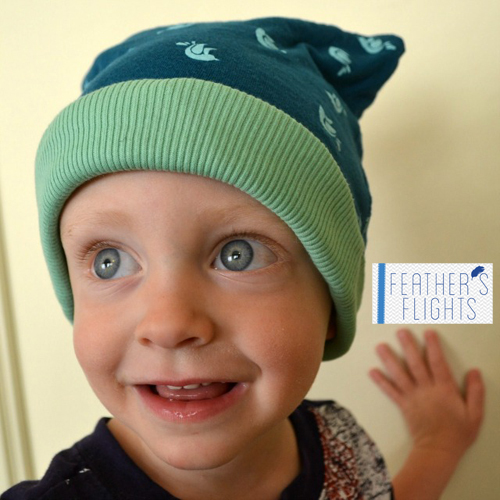 Heather (Feather’s Flights) had some fun making hats, bodysuits & pants! 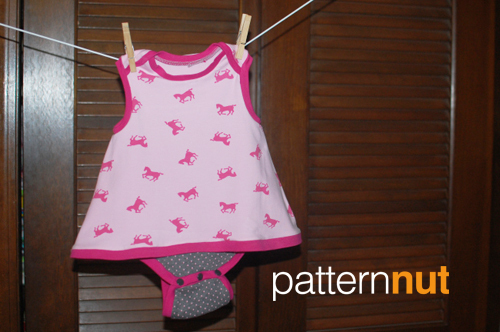 I love how Chrissy (Pattern Nut) used the Bitty Beetle Bodysuit/Gown pattern to make an adorable summer sun dress/bodysuit! BABY SUITE I can be purchased as a Bundle for Only $18.75 ($25 value sold separately). today through Friday, June 20, (midnight, EDT). After the sale, all patterns will be available for purchase individually and as a bundle in the Stitchwerx Designs Etsy Shop. There are four patterns in the Ainsley & Aiden Collection, Baby Suite I: #S115 Bitty Beetle Bodysuit, Tee & Gown pattern, #S117 Comfy Caterpillar Easy Knit Pants, #S118 Roly Poly Lined Pants, and #S120 Tiddly Wink Toppers. The Bitty Beetle, Comfy Caterpillar & Tiddly Wink Toppers patterns all include a special bonus section with tips for sewing knits without a serger. The Bitty Beetle and Comfy Caterpillar patterns also have a bonus “Faux Coverstitch Quick Tutorial”. You do not need a serger to sew any of the garments included in this suite of patterns. Our blog tour takes a weekend break, but stop by Monday, June 16 to see our Blog Tour Day 4 participants! Follow Stitchwerx Designs on Facebook to keep up with the latest news and promotions. Stop by the Stitchwerx Designs Etsy Shop to purchase patterns. 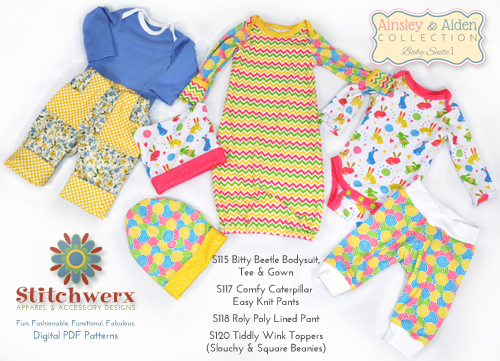 This entry was posted in Baby Clothes Patterns, Giveaways, Sewing, Sewing Patterns and tagged Ainsley & Aiden collection, baby sewing patterns, baby suite I, baby suite I blog tour, layette sewing patterns, stitchwerx, stitchwerx designs, stitchwerx giveaway. Bookmark the permalink.